Home photoshoot makeup Kia and Ren talk Photoshoot Makeup! I love teaming up with my fellow bloggers. One of my most favorite, Kia From Yummy411 hit me up with a proposal to touch on a new topic..."How to get your makeup looking great for photos." We decided to come up with some easy tips for you guys. Check out Kia's tips here. 1) Avoid spf in your foundation or moisturizer…SPF will cause you to have a white cast on the face. 2) Invest in photofriendly makeup. 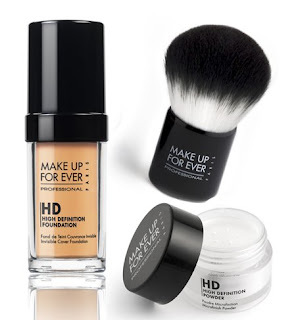 Many new HD lines are popping up including MUFE HD’s new line and Cargo Blue Ray’s line. 3) Photoshoot makeup is different than street makeup…you have to apply more for it to show up and not be washed out by lighting. In this case, less is not more, more is more! 4) If you're doing makeup on yourself, get yourself a magnifying mirror…good cameras, especially SLR’s can pick up the tiniest blemishes and streaks that you might not see from your bathroom mirror . 5) Keep good blotting powder on hand. Multiple touch ups will be necessary. Photographers love the way a matte look comes up on film. Those lights can make you melt! 6) Lastly, test your makeup on camera by checking how it looks on the view screen. This is important for both photography and film. This is when the look really matters. Do any necessary touch ups. And voila, you’re done! great tips!! thanks Ren! i can't wait until i make it big time and they have that huge screen at the shoot (indoors?) for you to check the image.. 0_0 love it! me either girl, big time here we come! Hi ren-great tips, thanks for sharing my dear! have a good weekend too! oh fab tips thank you!! I already do the last tip ritually..lol. great tips, don't forget photoshop is your friend. Very helpful!! I did not know the thing about spf casting a white look! I love how you guys worked together on your recent posts. I really appreciate you & Kia posting this ! i really want those cameras! Thanks for the SFP/white cast tip! Fantastic tips! OMG! I did not know that about SPF!! That makes so much sense!! And I also went right out and bought a magnified mirror because it really does help you to see EVERYTHING!!! great tips! i had no clue about spf in foundation. good to know!